Farmer John can cater for more demand, by increasing the number of chicken coops or by buying another farm and by taking on more farm hands to handle the increased workload. He can still use his shop to sell eggs from the new farm but would need to take on a new person to keep detailed records for the new farm. As it will be impossible for Lisa to do the record keeping work load of two farms. The Ministry will need to issue a new separate license for an agreed number of people who can be served eggs from the new farm. Likewise a new license will need to be obtained for the new Citrix XenApp farm and this can be set up on the existing Citrix License server. 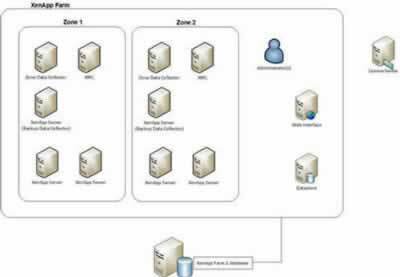 Likewise the XenApp farm administrator can create more zones and add more XenApp servers into each zone to cater for more demand, as shown in the screenshots below. The administrator can also create a separate XenApp Farm, as shown in the screenshot above. 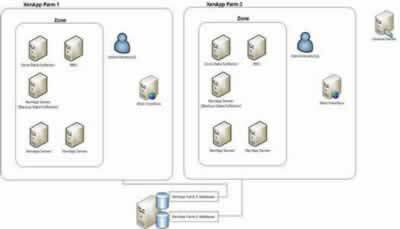 A separate XenApp farm can utilise the existing web interface as a shop front to the applications available from both XenApp farms. An additional separate database will be required to cater for the data storage requirements of the new Citrix XenApp farm.